A battalion is a military unit. The use of the term "battalion" varies by nationality and branch of service. 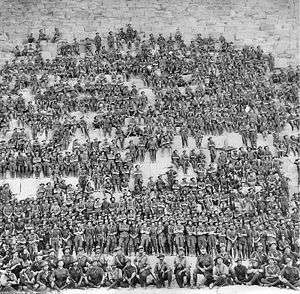 Typically a battalion consists of 300 to 800 soldiers and is divided into a number of companies. A battalion is typically commanded by a lieutenant colonel. In some countries the word "battalion" is associated with the infantry. A battalion is the smallest military organization capable of "limited independent operations", in that the battalion is the lowest-level organizational unit containing an organic coordinating, or executive, staff (i.e., S-1, S-2, etc.) and a support and services unit (e.g., headquarters and headquarters company). The battalion must, of course, have a source of re-supply to enable it to sustain operations for more than a few days. This is because a battalion's basic load of ammunition, expendable weapons (e.g., hand grenades and disposable rocket launchers), water, rations, fuel, lubricants, replacement parts, batteries, and medical supplies normally consists of only what the battalion's soldiers and the battalion's organic vehicles can carry. In addition to consisting of sufficient personnel and equipment (usually at least two primary mission companies and one mission support company) to perform significant operations, as well as a limited self-contained administrative and logistics capability, the commander is provided with a full-time staff whose function is to coordinate current operations and plan future operations. A battalion's subordinate units (companies and their organic platoons) are dependent upon the battalion headquarters for command, control, communications, and intelligence and the battalion's organic service and support structure to perform their mission. The battalion is usually part of a regiment, brigade, or group, depending on the organizational model used by that service. The bulk of a battalion's companies are often homogeneous with respect to type (e.g., an infantry or tank battalion), although there are exceptions such as combined arms battalions in the U.S. Army. A battalion includes a headquarters company and some sort of combat service support, typically organized within a combat support company. An infantry battalion is numbered ordinarily within its regiment (e.g., 1st Battalion, The Rifles, usually referred to as 1 Rifles). It normally has a headquarters company, support company, and three rifle companies (usually, but not always, A, B and C companies). Each company is commanded by a major, the officer commanding (OC), with a captain or senior lieutenant as second-in-command (2IC). The HQ company contains signals, quartermaster, catering, intelligence, administration, pay, training, operations and medical elements. The support company usually contains anti-tank, machine gun, mortar, pioneer and reconnaissance platoons. Mechanised units usually have an attached light aid detachment (LAD) of the Royal Electrical and Mechanical Engineers (REME) to perform field repairs on vehicles and equipment. A British battalion in theatre during World War II had around 845 men in it, and, as of 2012, a British battalion had around 650 soldiers. With successive rounds of cutbacks after the war, many infantry regiments were reduced to a single battalion (others were amalgamated to form large regiments which maintained multiple battalions, e.g., the Royal Anglian Regiment). A battalion group or battlegroup consists of an infantry battalion or armoured regiment with sub-units detached from other military units acting under the command of the battalion commander. A mechanised infantry battalion usually consists of one command- and medical company, three mechanised infantry companies, and one support company which has three platoons with heavy mortars and three platoons with anti-tank missiles (TOW). With the Dutch artillery units, the equivalent of a battalion is called an "afdeling" (which translates to "section"). Combat companies consist of (usually mechanised) infantry, combat engineers, or tanks. In the latter case, the unit is called an "eskadron", which translates roughly to "squadron". There are also support battalions in the Dutch Army, which specialise on specific task: for example, supplies and transport or communications. In the United States Army, a battalion is a unit composed of a headquarters and two or more batteries, companies or troops. They are normally identified by ordinal numbers (1st Battalion, 2nd Squadron, etc.) and normally have subordinate units that are identified by single letters (Battery A, Company A, Troop A, etc.). Battalions are tactical and administrative organizations with a limited capability to plan and conduct independent operations and are normally organic components of brigades, groups, or regiments. During World War II, most infantry regiments consisted of three battalions (1st, 2nd, and 3rd) with each battalion consisting of three rifle companies and a heavy weapons company. 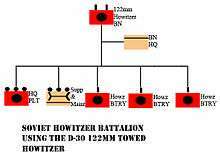 That is, rifle companies A, B, C along with heavy weapons company D were part of the 1st battalion, rifle companies E, F, G, and heavy weapons company H constituted the 2nd battalion, and rifle companies I, K, L, and heavy weapons company M were in the 3rd. There was no J company: the letter J was traditionally not used because in 18th and 19th centuries old-style type, the capital letters I and J looked alike, and were therefore easily confused with one another. It was common for a battalion to become temporarily attached to a different regiment. For example, during the confusion and high casualty rates of both the Normandy landings and the Battle of the Bulge, in order to bolster the strength of a depleted infantry regiment, companies and even battalions were moved around as necessary. 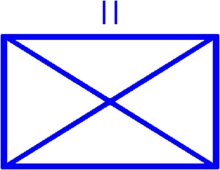 From the 1960s through the early 1980s, a typical maneuver (infantry or tank) battalion had five companies: headquarters and headquarters company (HHC) and A, B, and C companies, plus a combat support company (CSC), with a scout platoon, 4.2 inch heavy mortar platoon, along with other elements that varied between organizations. These included heavy anti-tank TOW missile platoons, ground surveillance radar sections and man-portable anti-aircraft missile sections. Beginning in the early 1980s, some elements of the combat support companies (the mortar and scout platoons) were merged into the headquarters company with the staff and support elements, others were moved to their parent type organization (ground surveillance radar and air defense), and in infantry battalions the heavy anti-tank missile platoon was organized as a separate company (E company). In the late 1980s, there was a fourth "line" company added (D company) in most infantry and tank battalions. In this older structure, U.S. Army mechanized infantry battalions and tank battalions, for tactical purposes, cross-posted companies to each other, forming a battalion-sized task force (TF). Starting in 2005–2006, the U.S. Army mechanized and tank battalions were reorganized into combined arms battalions (CABs). 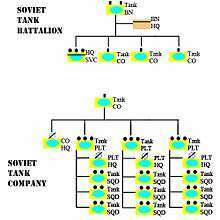 Tank battalions and mechanized infantry battalions no longer exist. These new combined arms battalions are modular units, each consisting of a headquarters company, two mechanized infantry companies, two armor companies, and a forward support company attached from the battalions parent brigade support battalion. This new structure eliminated the need to cross-post (or as it is more commonly referred to, cross-attach) companies between battalions; each combined arms battalion was organically composed of the requisite companies. 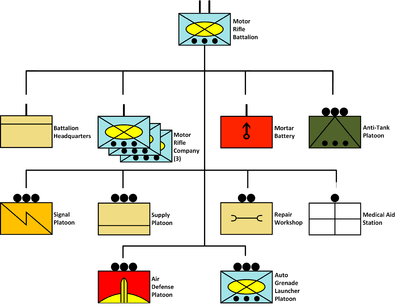 At a higher level, each armored brigade (formerly designated as a heavy brigade) is now composed of three CABs (vs. the two CABs of a former heavy brigade), an armored reconnaissance squadron, a fires battalion (field artillery), a brigade engineer battalion (BEB), and a brigade support battalion (BSB). ↑ Boyce, Alan S. "Military Organization, Army." Encyclopedia of Military Science, edited by G. Kurt Piehler , Sage Publications, 2013, p. 874. ↑ FM 100-2-3. United States Army. June 1991. p. 4-4 (35).